Here we are. Let me know if this touches on all previously mentioned elements. Also, you’ll notice that because of his angle and posture, the overall space that Eloden occupies is more a square compared to the vertical rectangle of the previous kings. Let me know if this is going to be an issue on the player mat and we can work to revise his stance a bit and tighten up the box. This is awesome! I really like how everything works together; the moose antlers are looking great with the bear headpiece! Very nice. I really like how the dreadlocks appear and his battle cry as well. Everything you did here for the components looks good to me man. The only thing missing is the horn and the rectangle strip loincloth. Also I think that having said oval shape for the gem in the axe might have been the wrong way to describe it. When I was thinking oval, I failed to mention that I meant from the side. I made a quick image to show you the shape of the gem. I’m hoping we can get the circle shape of the gem to cover a large surface portion of the axe face. So as far as the pose, it looks like you rotated number 1’s pose clockwise 45 degrees rather than counter-clockwise. I should have said mirroring number 3 rather than juxtapose, sorry about that. However this may turn out to our benefit. 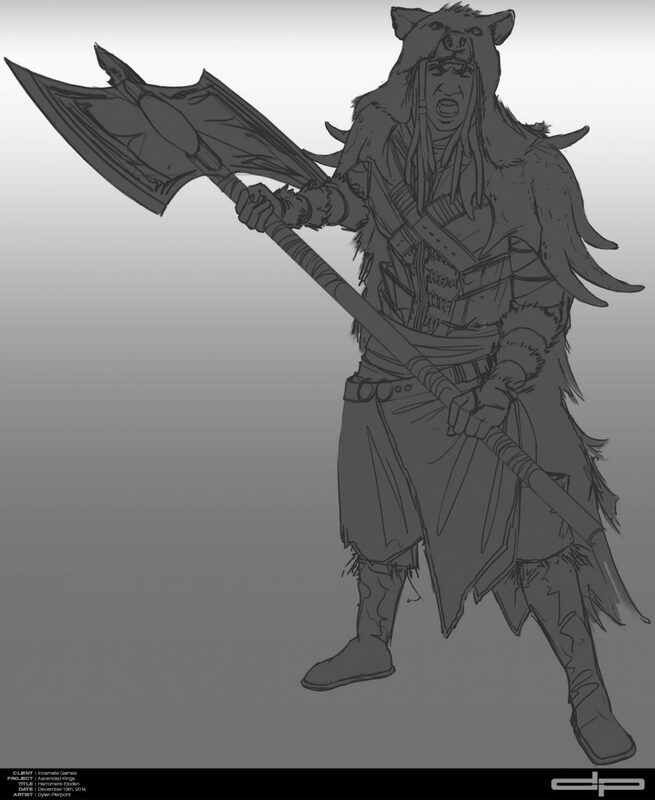 I was back and forth with having Eloden be right or left handed because of where the axe would be if he was holding it up like this. This has been a challenge all along since our characters are on the left side of the player mat. If you look at the player mat example I posted here you can see that we will be able to keep the pose you made if we were to flip the image horizontally. This would appear to make him left handed which is perfectly fine with me. This makes it so that only Apsu and Eloden are left handed. Please note that this isn’t the final play mat, we will still have Anthony making the final design for these as well as incorporating your background art. I would like to hear your thoughts about flipping the character. I think doing it this way would be best because it really emphasizes Eloden’s weapon in a way that is unlike any of the other kings. Ah! The horn and loincloth. I had a feeling I missed out on something. Thanks for the reminder. I’ll get those added straight away.And the axe stone is an easy fix. From this angle it’s going to be somewhat ovular, but at least I know now it has a circular cut from the top view.If you’re ok with flipping his pose, I think that’s a really elegant solution. I mis-read your statement about the clockwise/counter-clockwise rotation, so I apologize for that. You’re mock-up works pretty well with the current playmat design so if things don’t drastically change before the final then we should be good! I’ll move forward with the design. Let me know if anything else pops up in the next few days so we can address it early!Cheers! Stay tuned for EPISODE # 0049 – Kynazarr Orthographic 1 which will be posted soon!